When Fans for the Cure founder and CEO Ed Randall was diagnosed with an aggressive case of prostate cancer in 2003 he immediately realized he was completely in the dark about a disease he later learned had been diagnosed in over 220,000 men in the U.S. that year. 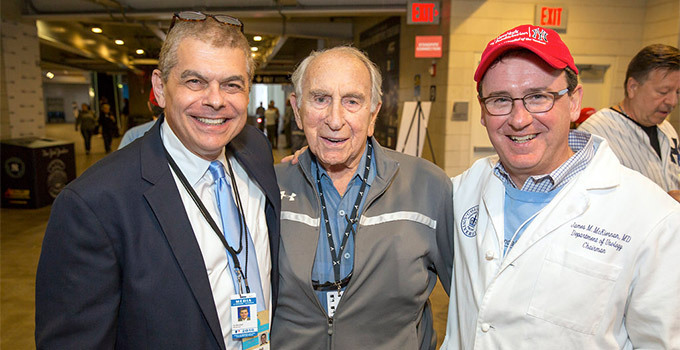 As he checked in with his male friends, business colleagues, and his contacts from the world of baseball who were over the age of 40, he similarly came to understand that these men also knew little to nothing about prostate cancer, even though the disease was the cause of death for over 29,000 U.S. men in 2003. It was in perceiving an urgent need to narrow this knowledge gap that inspired Ed to create Fans for the Cure in the fall of 2003. What began with a softball game in the December snow and $100 checks from former Major Leaguers such as Ed Kranepool and Bud Harrelson has now blossomed into a charity that makes a Summer Road Trip to over a hundred Minor League ballparks. At the charity’s table within the ballparks volunteers hand out educational materials and, when possible, healthcare organizations work with the teams to offer free confidential PSA screenings. Since 2003 Fans for the Cure’s message has stressed the importance of baseline PSA screenings and early detection of prostate cancer – and the greater number of treatment options and more positive outcomes that result from early detection of the disease. As we approach 2017 we have come to appreciate the lively dialogues and discussions that have taken place about prostate cancer everywhere from medical conventions we have attended, to seminars we have co-sponsored, to the front page of the New York Times. Ben Stiller credits his medical team and a PSA test before the age of 50 for catching his case of Gleason 7 prostate cancer in its earliest stages. But the U.S. Preventive Services Task Forces is discouraging PSA screenings altogether, citing the growing number of severe lifestyle complications (e.g. incontinence, impotence, infections) resulting from aggressive treatment of what turn out to be mild cases of prostate cancer that would not have threatened the patients’ lives or even presented symptoms. A conversation with Dr. Jim McKiernan (Urologist-in-Chief, NewYork-Presbyterian/Columbia) of the Fans for the Cure Medical Advisory Board was enlightening. He suggested that we allow men to decide what they define as “awareness.” For some, he said, it would be our old model – know that prostate cancer is a prevalent disease among men of a certain age, try to get tested. For others, it would be closely monitoring their PSA scores for significant upward changes from test-to-test, all in consultation with a doctor. And for men who are diagnosed, awareness would be in seeking out best practices, knowing that sophisticated blood tests exist, and grasping the concept of active surveillance, where aggressive treatment is deferred in favor of more frequent PSA testing and, if dictated by the PSA scores, biopsies. The latest statistics show that 40% of those men choosing active surveillance eventually undergo treatment, but it also means that 60% deciding on that course with their doctors are spared risk of complications. Taking Dr. McKiernan’s solid advice, we enter our fourteenth year with an eye on growing our mission and spreading awareness to men at all phases of the prostate cancer continuum. In addition to educational materials and screenings, we will also be there to provide doctor and hospital referrals in all parts of the country and to be advocates for men in finding the most effective and appropriate treatment plans for their specific cases of prostate cancer. We wish all our readers and friends of the charity a healthy holiday season. Should you have questions about any aspect of prostate cancer or the name of a doctor we know in your area, don’t hesitate to get in touch with us through the confidential Ask a Question section of the website.